As usual, I hit the bandwagon a little late on this one. Evolution is already out, yeah? But I'm still dying to get a hold of this. The blurb is just bare-bones enough to catch my interest and give me a tease of what's coming. Amnesia stories can bug me, but I have faith in this one. Also, I'll admit it: the cover is pretty and I want it. And I'm a little bit of a hopeless romantic, so I'm hoping this love thing is well done and entwined around a strong central plot. Not to mention the hints of supernatural goings-on. I'm in. Speaking of wishlists, why not join the Random Acts of Kindness (RAK) program? Get a book, give a book. Spread the love. Check out the banner on the left sidebar to join and see who else is on the list! I just read this one a couple of months ago, and really enjoyed it... and just got book 2 from the library. "Unbecoming" was a great read -- I hope you get to it soon! 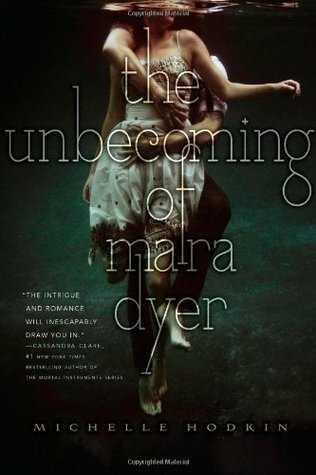 I LOVED the Unbecoming of Mara Dyer and the sequel was even more awesome! :) I hope you like it as much as I did :D! I really really want to read this series! Here is my Wishlist Wednesday post.